Sales of optical components and modules dropped sharply in the first few months of 2017 because of very low demand for these products in China. 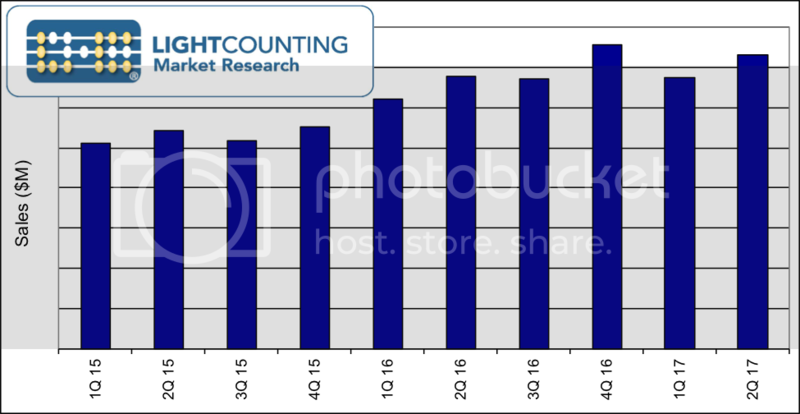 The situation in China remains uncertain, but the market for optical transceivers managed to return to growth in the second quarter of 2017, as shown in the figure below. Sales of Ethernet and DWDM transceivers reached new highs in Q2 2017, lifted by rapidly-growing shipments of 100GbE QSFP28 and 200G ACO CFP2 modules. Shipments of 100GbE QSFP28 transceivers in Q2 2017 more than doubled in volume from the previous quarter, exceeding 600,000 units. Demand for these products from operators of mega datacenters has exceeded our expectations by about 10% so far. Our updated forecast for the Ethernet transceiver market will be released on September 29th, along with the High Speed Ethernet Optics Report. Q2 was also the first quarter that shipments of DWDM ACOs were higher than the number of DCO transceivers, confirming our projections published earlier this year. A refreshed forecast for the DWDM market will be included in the Market Forecast Report scheduled for publication in late October. A detailed analysis for sales of 100G DWDM, 40GbE and 100GbE optics in the first two quarters of 2017 as well as all quarters of 2015-2016 is presented in LightCounting’s quarterly sales database, released along with the Market Update Report. The database includes historical data on quarterly shipments and pricing of more than 100 products in the Ethernet, CWDM/DWDM, SONET/SDH, Fibre Channel, FTTX, Wireless Fronthaul, EOM and AOC market segments. More than 20 of the leading optical component and module suppliers contributed data to this report. The report also presents an analysis of the revenue and spending trends of top-tier Communication Service Providers (CSPs) and Internet Content Providers (ICPs), financial results of telecom and datacom equipment vendors, and the market shares of the leading suppliers of 100G and 200G DWDM transport equipment. The report also includes analysis of the recent financials of leading communication semiconductor vendors. LightCounting subscribers are also invited to a webinar discussing highlights from this report on September 13th. Please email renee@lightcounting.com to join this event or get a link to a replay.